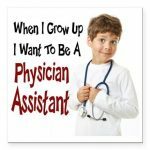 You are here: Home / Pre-Physician Assistant / 20 Answers to The Question: Why Do You Want to be a Physician Assistant? You will be asked many different times: "Why?" "Why do you want to become a physician assistant?" "Why don't you just go to medical school or NP school?" "You will make more money as a physician; you will have more prestige and recognition as a physician." 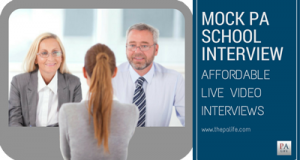 Your response to these questions and your final decision to apply to a PA program will depend on how thoroughly you research an answer to these questions. 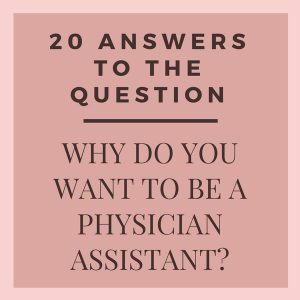 Here are 20 answers given by passionate pre-physician assistants along with a couple practicing PAs who are members of my Facebook community. Cast your vote for your favorite at the end! 1. Nick Baron: I want to be a PA . . .
2. Noelle Harford: I want to be a PA . . .
3. 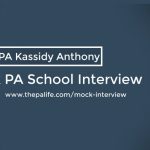 Ashley Duckworth: I want to be a PA . . .
4. Rachel Hofmaier: I want to be a PA . . .
5. Lyndsey Eaden: I want to be a PA . . .
6. Ibad Ahmed: I want to be a PA . . .
7. Taylor Cook: I want to be a PA . . .
8. Andrea Renae Evers: I want to be a PA . . .
9. Jennifer Livingston: I want to be a PA . . .
10. Beth Rushing: I want to be a PA . . .
11. Danielle Giovannagelo: I want to be a PA . . .
12. Linda Castillo: I want to be a PA . . .
13. Rachel Weaver: I want to be a PA . . .
14. Hannah Kambo: I want to be a PA . . .
15. Kerri L Orwig Connell: I want to be a PA . . .
16. Rita Tolchynska: I want to be a PA . . .
17. Patty Chun: I want to be a PA . . .
18. Nick Baron: I want to be a PA . . .
19. Timona: I want to be a PA . . .
20. Monika Duda: I want to be a PA . . .
21. Sierra Gray: I want to be a PA . . . Please take a moment to share your answer in the comments section. It resonates more with me as I am entering pa training after many years as a nurse.